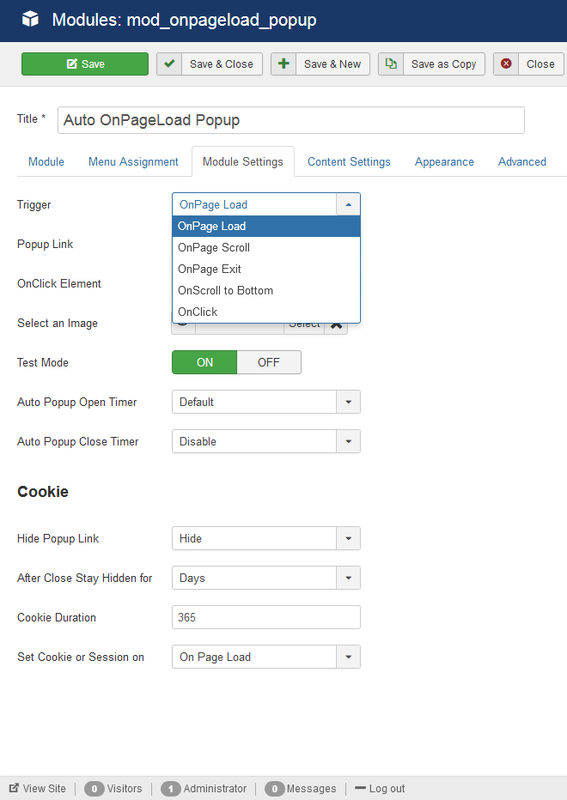 Auto Onpageload Popup installation, capabilities, features and options. Note: This documentation applies to Version 7.7 and above only. After successful UNZIP of the file AutoOnPageLoadPopup_UNZIP you will find the module zip file and the ReadMe.txt file inside the folder. OnPage Scroll : The popup will open when the page is scrolled. The Scroll Amount can be defined in the Advanced Settings of the module parameters. It will open once when the page is scrolled down. OnClick : The popup will open on clicking the link or image. You can set the link or image for the popup and publish it in a module position. Set Popup Link Parameters to Show. Popup Link : You can show or hide the popup link which appears in the module position. The popup can only be linked to a text or image inside a module or article using loadposition. It can't be linked to a Menu item or other module. OnClick Element/Link : The onclick element can be an image or any HTML text. You can add your own HTML and stylize it by adding css to the extra CSS parameters in the advanced settings. OnClick Text : You can add simple text or add any HTML with class, id and different attributes. Select an Image : Option to select an image from the media gallery and link it to the popup. Hide Popup Link : You can hide the popup link once the cookie/ session is set. If you don't wish to hide it then the link will be inactive. After close stay hidden for : You can set this to Session, Seconds, Minutes, Hours or Day depending upon your requirements. Cookie Duration : This accepts numeric value for example you want cookie to expire in 15 mins, so you can just set 15 in this field. For 30 days you can set 30 and similarly for 2 hours you can set it to 2. Set Cookie or Session On : Cookie/Session can be set either on clicking the close(X) button (On Closing Button) or just on a single page load (On page Load)without client interaction. HTML or Plain Text - For HTML or plain text you can use both the methods.Editor or Joomla Articles. Image - If you want to popup a single image then you can select the image. If you want to use image with some text then you can use the editor to add image and text into the popup. Message Input Method : You can use Editor or Joomla Articles. Height : Set the height of popup box in pixels. For example if you want to set the height as 500px, then mention 500. The extension is responsive, if you don't have contents which will need 500px height, then it will automatically resize to smaller. Width : Set the width of the popup box in pixels. This will be the maximum width of the popup. It will automatically resize according to screen size. Set 800 if you want maximum width of the popup box as 800px. Background Color: Option to choose the background color of the popup using color picker. Text Color: Choose the color of the text inside the popup. Content Padding : Padding around the popup content box. Content Margin: Margin around the popup content box. Style : Select the border style of the box from the list. Color : Set the color of the border with opacity. Width : Set the width of the border. Image : Choose a pattern from a list of 10 predefined pattern styles. Set to none if you want to set a background color instead of patterns. Color : Select the background color of the overlay using the color picker. If you don't want any background color then set Opacity to 0 by selecting. Close on Click : Set to disable if you want to stop the popup to close on clicking on the overlay. Button : Option to show or hide the popup close button. 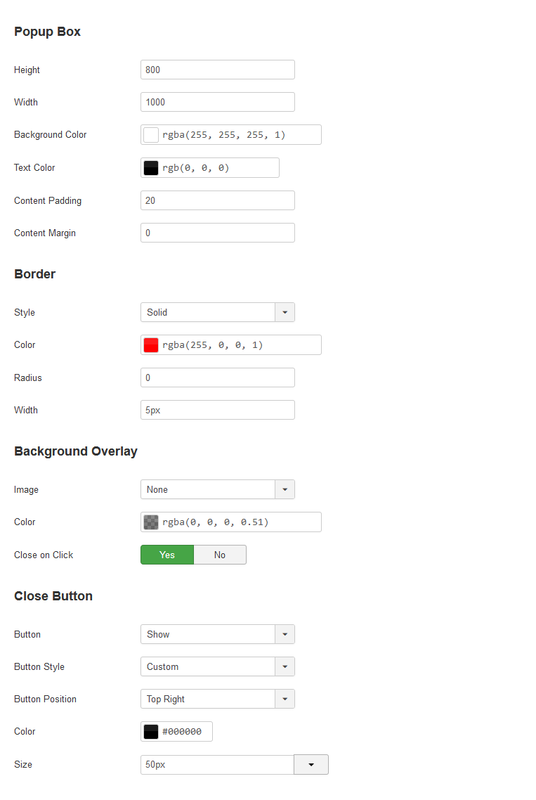 Button Style: Choose close button style from the list of 10 predefined styles. Set it to custom if you want to set your own style. Button Position: Select the position where you would like the button to appear. Color: Set the color of the button using the color picker. Size : Set the size of the custom close button. Trigger Scroll Amount : Add the height after which the popup will open upon scrolling the webpage. Disable after Login : Set to Yes if you want to disable the popup after Joomla login. 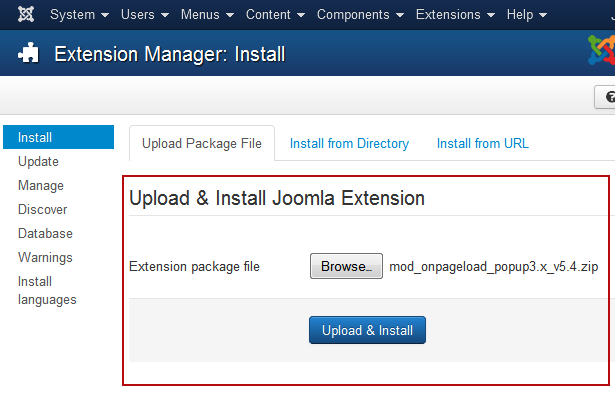 This feature can be used to popup joomla login module and the close upon successful login. Minify JS and CSS : Set to enable if you want to load the minified version of the CSS and JS file.